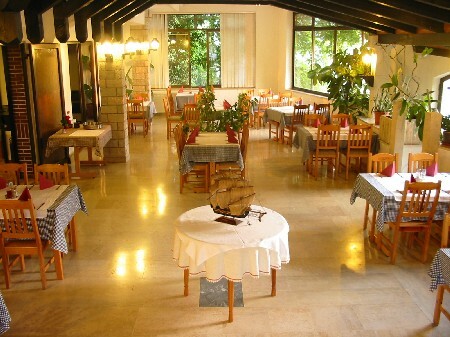 Gastro-Pension Gargamelo is located in a quiet part of Porec, 3 km north from the old town centre and 1.5 km from the seafront. The pension lies in a residential street surrounded with fields and trees. The coastline near Gargamelo offers a variety of beaches; rocky and pebbly beaches and a number of beaches with concrete sunbathing areas and various facilities belonging to nearby hotels, such as Hotel Laguna Materada. The sea and beaches in the area have been awarded the international Blue Flag for their excellent quality. The charming old town of Porec invites you to walk through its beautiful cobble stone streets and discover little old squares, palaces, centuries old monuments and interesting museums and galleries where the past comes back to life. You can visit the highlight of the town; the Euphrasian Basilica, a UNESCO World Heritage Site, with its magnificent Byzantine mosaics and stunning view over the town and the sea from its bell tower. 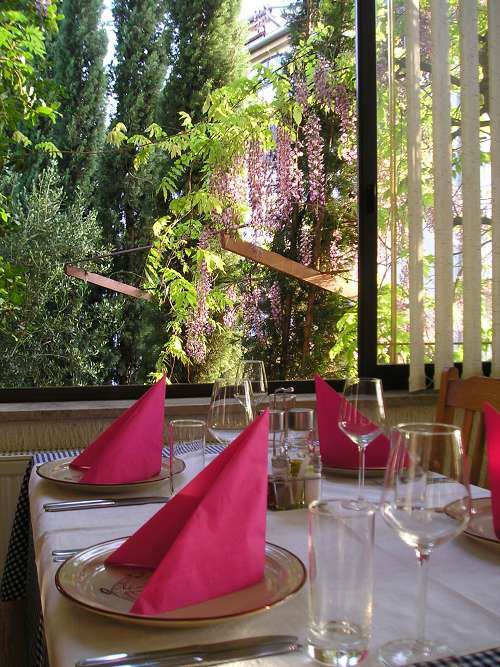 Porec has a rich offer of restaurants where you can try local delicacies and traditional Istrian cuisine and many popular cafés, bars and night clubs.This popular coastal resort has won many national tourism awards for its outstanding quality. Porec is also famous for its many (water)sport facilities, including tennis, golf, mini golf, scuba diving, water skiing and much more. The variety of activities available in and around Porec makes this area a perfect holiday destination for families, couples, youth, adventure seekers, nature and culture lovers. Porec is an excellent departure point for many interesting excursions, for instance to the lovely old town of Rovinj, the Brijuni Island National Park, the 3000 year old town of Pula with its famous amphitheatre and the Plitvice National Park with its beautiful lakes and waterfalls. 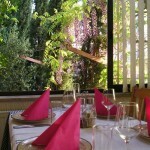 The family-owned Gastro-Pension Gargamelo wants to offer its guests the best possible gastro experience and puts a lot of care and attention into preparing tasty food for their continental breakfast buffet and a la carte restaurant which serves traditional Croatian dishes accompanied by local wines. 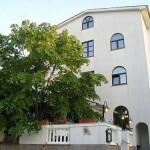 Guests can use the pension’s free wireless internet connection (in the whole building), free parking, laundry service and a garden. Gargamelo offers 20 rooms and 8 studios and apartments of various sizes; most rooms have a balcony and some rooms have an extra bed. 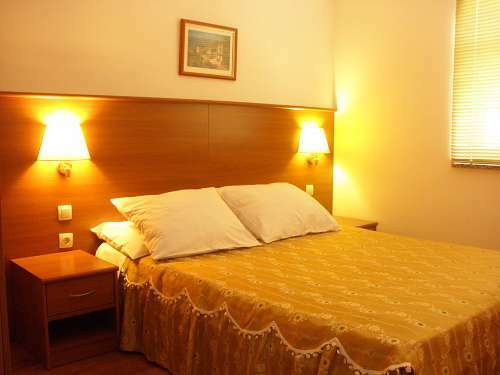 * Double room (2 pers.) with a double bed, air conditioning, satellite TV, private bathroom with shower or bathtub and hair dryer. Studio apartment (2 pers.) 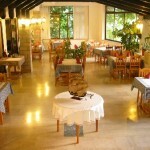 with a double bed, air conditioning, satellite TV, private bathroom with shower or bathtub, hair dryer and kitchenette. 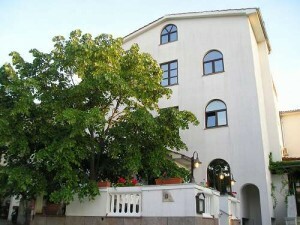 Family apartment (2+2 pers.) with a double bed and a double sofa bed, air conditioning, satellite TV, private bathroom with shower or bathtub, hair dryer, balcony and kitchenette. Apartment (4 pers.) with a double bed, living room with double sofa bed, air conditioning, satellite TV, private bathroom with shower or bathtub, hair dryer, balcony with sea view and a fully equipped kitchen. 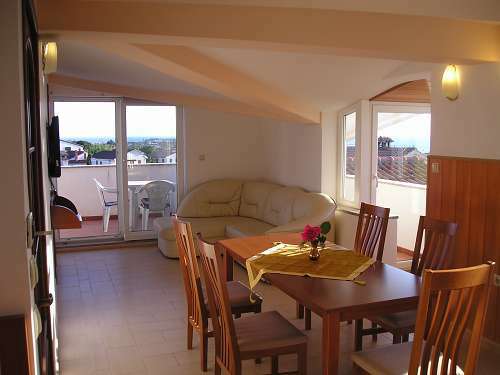 Apartment (6 pers.) 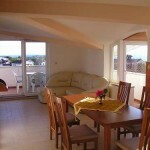 with 3 bedrooms with double beds, living room with double sofa bed, air conditioning, satellite TV, 2 bathrooms with shower, hairdryer, balcony with view over Porec and the sea, and a fully equipped kitchen.